This morning I helped my son’s kindergarten class plant a garden. It was perfect for my introverted self because the kids came up one or two at a time, and I was able to focus on each in turn, helping them dig their little holes, wiggle the plants out of their cases, and get the roots happily buried in the ground. I enjoyed spending this time with the kids. I was finally able to put some faces to names, and I appreciated the wide variety of personalities on display. We were outside, enjoying all the benefits of a brisk fall morning, loving the feel of the earth in our hands. (Well, I was wearing gardening gloves, so that last part not so much.) 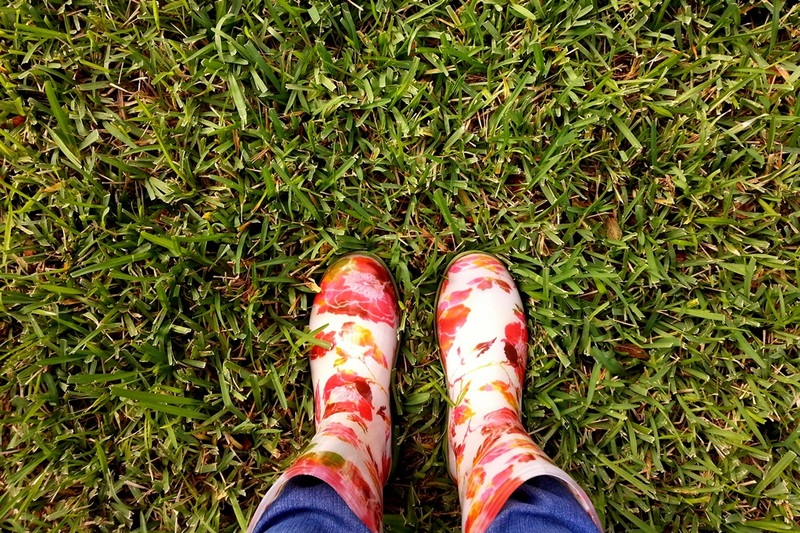 Plus, it gave me an opportunity to wear my cute floral rain boots. All in all, it was a beautiful morning. On the way home, I was struck by how different this experience was from most of the parent volunteer activities I’ve had in the past. Parent confession: I don’t like going on field trips with my kids’ classes. It’s barely controlled chaos, all those kids bursting with excitement. I get it, the kids are so pumped to be seeing and doing something different, and I’m happy for them, really. But that doesn’t make it any less exhausting to be near them. Even worse, the teacher usually puts you in charge of a small group of kids, and without fail there is one kid in your group acting like a punk. I hate these situations because I’m not good at controlling other people’s kids. I know how to control my own more or less (usually by gripping their arm tightly and threatening to take away their tablet in my best “quiet yell” voice—obviously I do not have Mary Poppins skills). But yelling at other people’s children, even in a quiet voice, is generally frowned upon. And anyway I don’t have access to their tablets. So instead I just spend the entire field trip trying to redirect and feeling like an ineffective pushover. So, back to my point, this morning was a big success. And it makes me think, why didn’t I think of this a lot sooner in my parenting career? Why haven’t I sought out opportunities that are a better fit for me? I am a big time introvert, and field trips are a big time extroverted activity. There is no hard and fast rule that says parents have to go on field trips. I was just holding myself to that standard because I’d never really examined it. How much better is life when you can accept who you are and align your life to match! My blog’s mission is this: ♥ Your Home, ♥ Your Life, ♥ Yourself. This post is part of an ongoing feature inspired by my mission. But how neat to find opportunities like this that fill your cup to enjoy hanging out with your son’s friends and classmates. You know, that day I thought of you and that conversation we had about teaching one on one versus to a group. :) It’s always nice to hear from you!